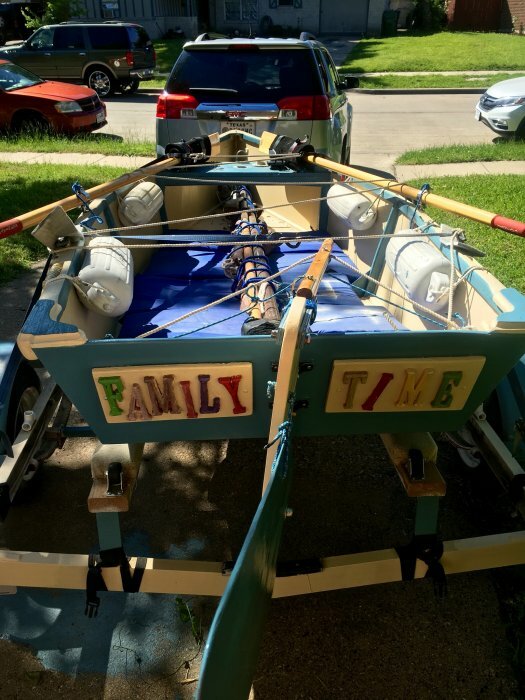 FAMILY TIME is a sailing tri-keel fin skiff, based on Summer Breeze by David Beede. She was garage built in Rowlett, Texas, from studying several sets of internet plans. Materials were mostly from Home Depot. Lauan plywood, KILZ original oil based primer, Glidden Exterior Porch and Floor paint, and PL Premium construction adhesive. The bottom 3 inches were also given a layer of fiberglass cloth and fiberglass resin. 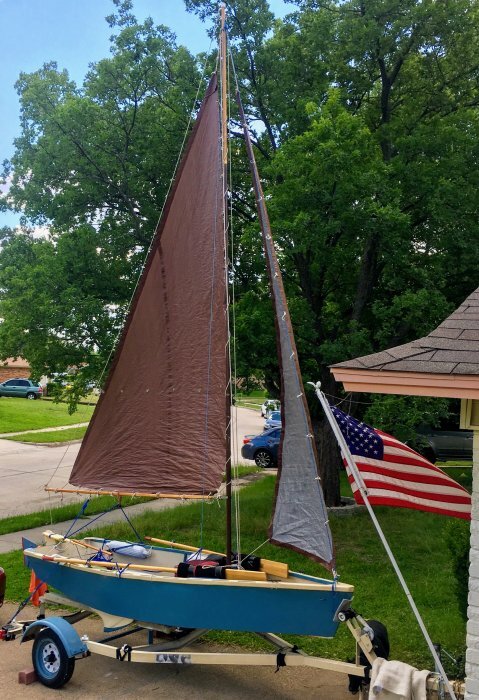 Mast is 16 feet tall made of 3 pieces of aluminum that connect together with a 4 foot long wooden masthead for the 3 stays. 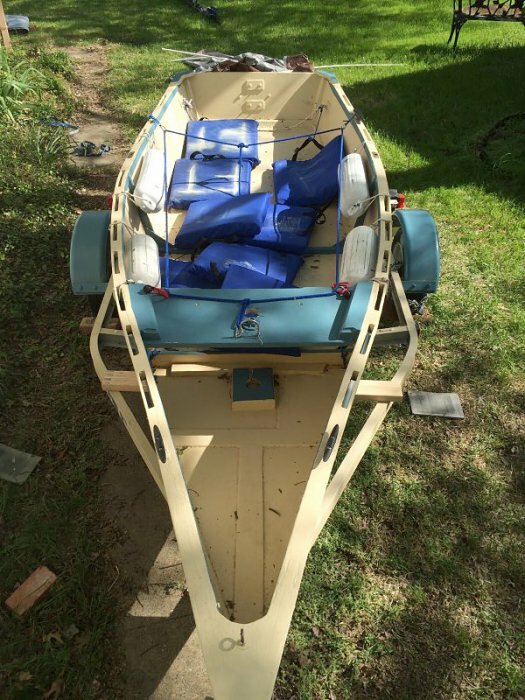 The boom is 9 foot long and made from 1 inch dowel that is dogboned along the side for weight and flexibility. 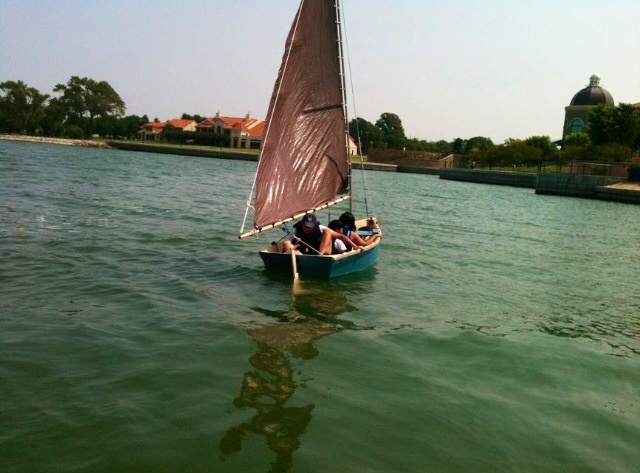 Sails are made from thin polytarp and last about 3 years with heavy use. We saved on the materials in the beginning but that was a mistake. We have to make repairs all the time because of delamination or soft spots. Lauan is not marine grade and will delaminate even with great conditions. Once every couple of years I have had to replace different small sections of the hull (approximately 4 sq feet each time). 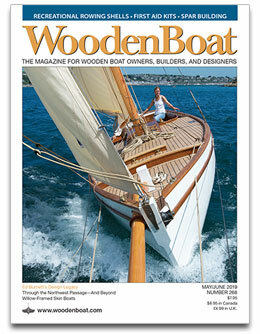 Better materials at the beginning will result in fewer repairs and more sailing. 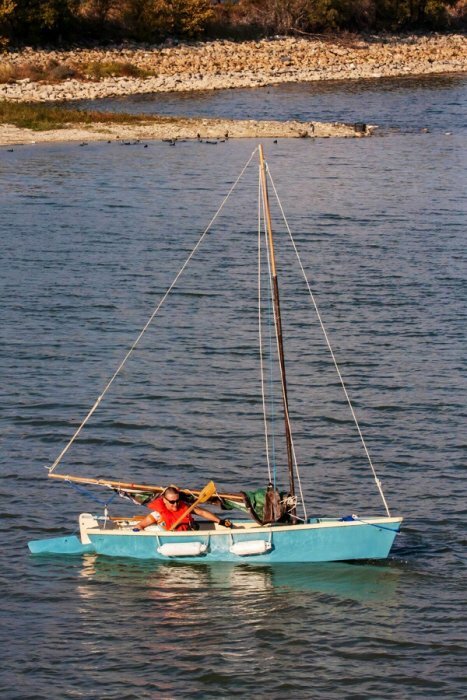 Recently I began repairing her using marine grade 1/4 inch Douglas fir plywood and marine epoxy resin. I am pleased with the ease of use of the epoxy and can tell that it will extend the life of her.